HONOLULU, Hawaii, September 17, 2013 (ENS) – Hawaii state and federal officials say they are still assessing the scope of the “severe” environmental damage from a molasses spill that dumped an estimated 233,000 gallons of the dark syrup into Honolulu Harbor, killing thousands of fish and forcing beach closures. A corroded, faulty pipe that runs under Pier 52 at Sand Island and pumps molasses exports onto Matson Inc. cargo ships likely caused the spill, company representatives and state officials said Tuesday. Matson will cover the costs associated with the Honolulu Harbor molasses spill response, not Hawaii taxpayers or shipping customers, Matson President and CEO Matt Cox said Monday at a news conference, held at Pier 34. The spill happened on September 9 about five miles west of Waikiki in an industrial area of the waterfront where Matson loads molasses and other goods for shipping. Cox announced that Matson immediately ceased its molasses operations following the incident and will not resume operations until the company is assured that it can do it in a safe and responsible manner. “Our goal always is to conduct cargo loading operations safely and in an environmentally responsible manner,” he said. Cox disclosed that his pipeline operations team is already working on a report that will provide him with information needed to determine the future of Matson’s molasses cargo business. “If it is determined that the system cannot be operated safely or in an environmentally responsible manner, and that repairing and replacing the system would be impractical, we will discontinue our molasses operations,” he said. Cox said the report would be provided to the Department of Health and other agencies once it is complete. Crews patrolling the water and coastlines have found roughly 25,000 dead fish and other creatures, officials said Monday. 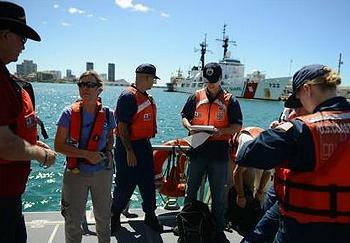 Representatives from the U.S. Coast Guard National Strike Force, U.S. Environmental Protection Agency, U.S. Fish and Wildlife Service and the National Oceanic and Atmospheric Administration are conducting water sampling as part of a joint effort to analyze the effects of the molasses spill. The combined team departed Coast Guard Station Honolulu Sunday morning aboard a 45-foot Response Boat-Medium. The National Strike Force crewmembers from the Atlantic, Gulf and Pacific Strike Teams used a water quality instrument to monitor depleted oxygen and pH levels at various locations around the harbor that were affected by the spill. The National Strike Force team members arrived in Honolulu Saturday after Coast Guard Sector Honolulu received an official request from the Hawaii Department of Health to assist with the response to the molasses spill in Honolulu Harbor. The request for federal assistance allows the Coast Guard to support the lead agency with resources including specialized response personnel, boats and equipment from the Coast Guard and other federal agencies. Founded in 1882, Matson is a U.S. cargo carrier in the Pacific serving Hawaii, Guam, Micronesia and other South Pacific islands, and operates a service from China to Southern California. The company owns a fleet of 18 vessels including container ships, combination container and roll-on/roll-off ships and custom-designed barges.